Ivy at Circle Thrice responded beautifully to my comment with a post about the magic of making things ourselves, and particularly for people that we care about. It’s not a post I wrote myself, alas. I shoulda. 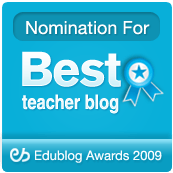 Because this blog, for better or worse, is a blog about magic. In large measure it’s a blog about the power of making things; it’s blog about the power of co-creation — the act of pulling the materials of the world to you, shaping them and changing them according to a particular vision, and producing something on the other end which is more than the sum of its parts. Something of your self is woven into the finished product, for better or worse. Yet in many ways, it is better than something bought through anonymous channels, through the mercantile trade of your hours for abstract concepts, and the trade of abstract concepts for the physical goods of your life. Today I broke down and went to the local fabric store. It has a name that sort of rhymes with pollyanna, but not really. I’d heard there was this magical tool there, something akin to a wand of fire or a disk of earth — a walking foot. (I also needed binding for the quilt I’m holding in these pictures. The binding is the pale green band around the outside of the quilt — it’s better to make that by hand from a 100% cotton fabric, but I am not good at making bias tape or binding — I could spend as long making enough bias tape to make this quilt, as I spent making the quilt). A Walking Foot? I hear you ask. Don’t most normal feet walk? Not on a sewing machine, they don’t. A walking foot attaches to the low shank of a sewing machine; and it has a mechanically-driven lever arm that hooks on to the needle’s drive shaft. The result is that the walking foot engages a second pair of dog-legs (those are the feet on the face of a sewing machine, that advance the fabric through the needle’s binding mechanism. This particular quilt had been giving me trouble. 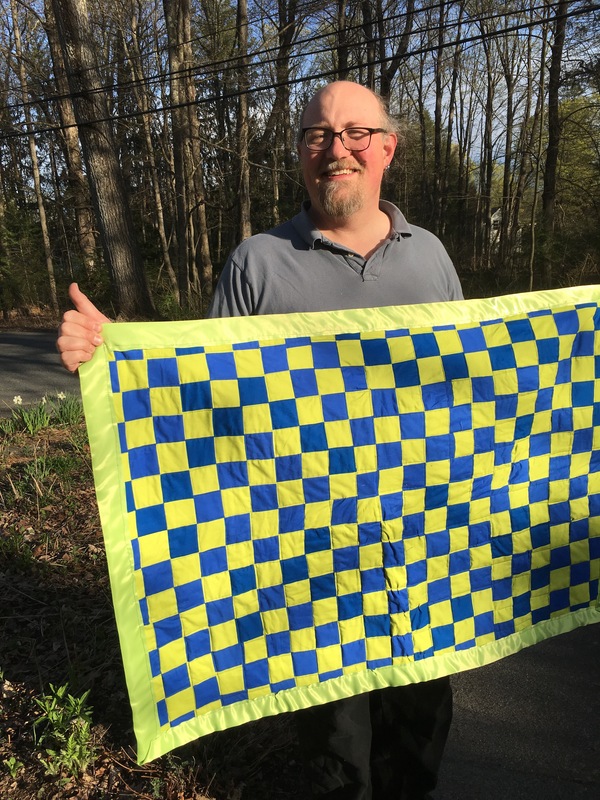 Truthfully, all of my quilts give me trouble in the same way. The first part of the work involves stitching together squares. I’ve gotten a LOT better at that work. 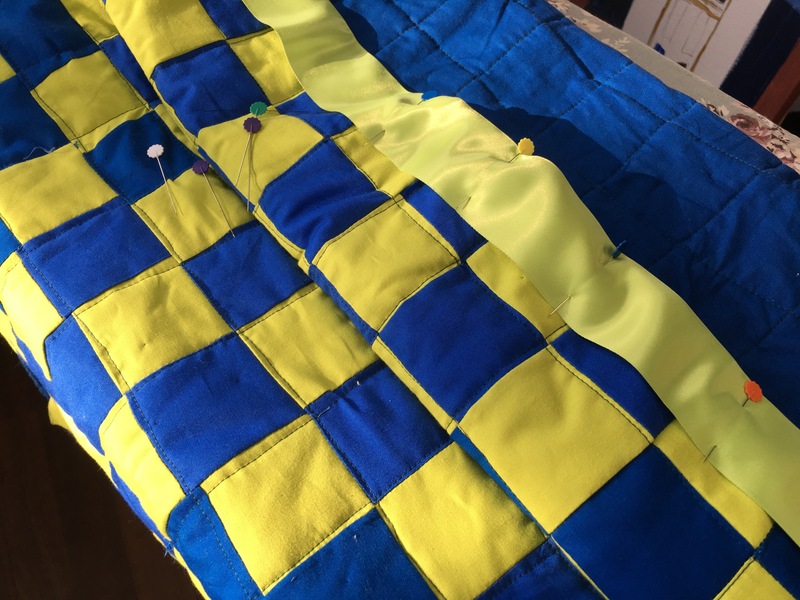 The second part involves quilting three layers together — in this case, the topper of green and blue squares; the batting, basically a thick layer of felt; and the backing fabric (the dark blue in the first picture). The three layers can be seen in the third picture. Today I broke down after doing the first half dozen straight stitches of this quilt. I needed quilt binding anyway. So I went to the fabric store for binding for this quilt, and got the walking foot. What a difference the right tool makes! The walking foot guides the fabric sandwich into the needle-space with great diligence and accuracy. 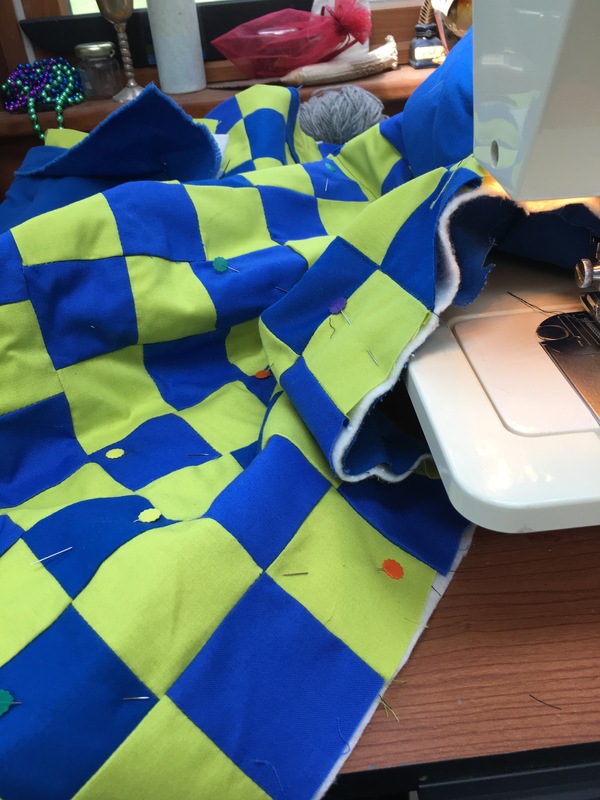 It’s a supremely powerful focus for the sewing machine, like a lens focusing a powerful beam of light into a laser — swiftly went the work of sewing the quilting stitches. 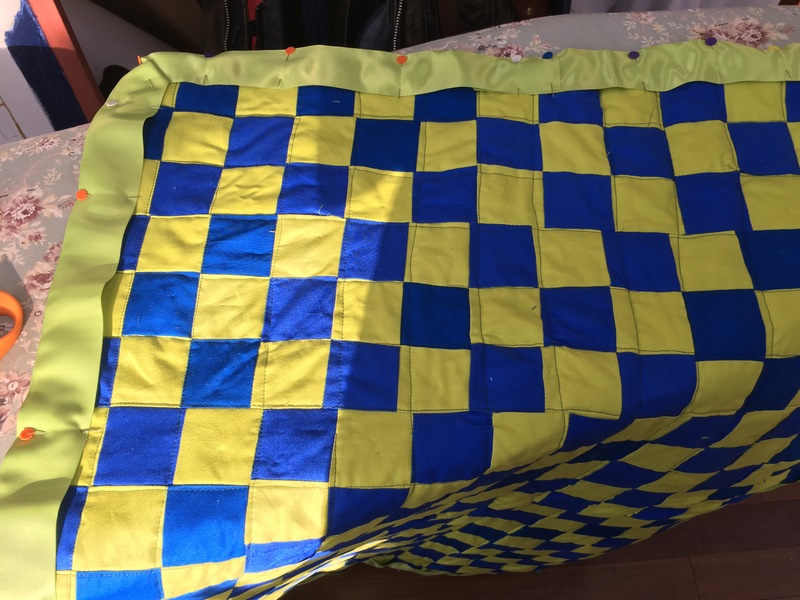 I was able to finish the rows of the quilting, and then the columns, with great accuracy. And then the binding around the edges went quite easily as well. Before the Walking Foot, this might have taken me the better part of two days of work with my old sewing machine. With the Walking Foot, a few hours at most. This is my seventh quilt, I think. It might be my ninth, but I think it’s probably the seventh. 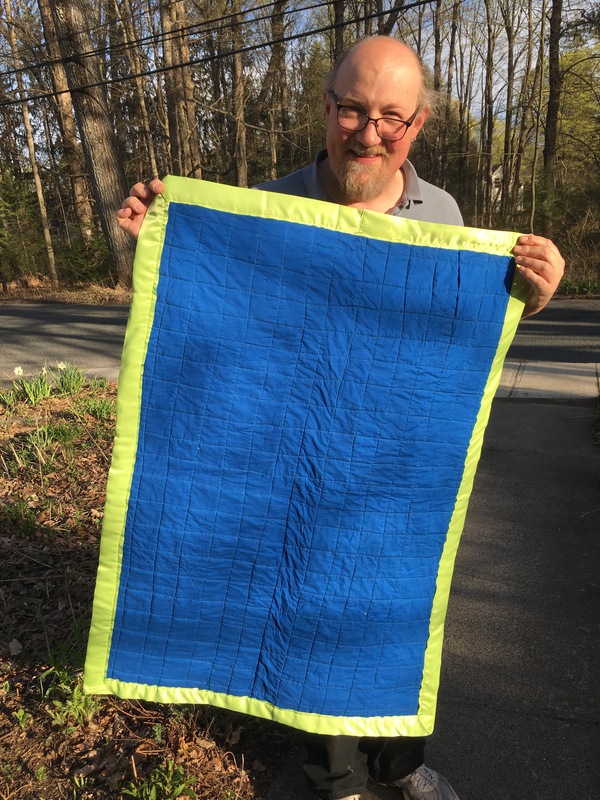 It’s taken me seven quilts to learn how to do this well enough, and effectively enough, that I learned what sort of problems I was having, and was able to do the research necessary to find the solutions. Every single one of seven quilts, I’ve gotten better at this. They may not be Etsy quality, but they’re a lot better than they were. In a short while, they’ll be a lot better than they are now. All aspects of Making are like this — you have to be an apprentice before you can be a journeyman; and you have to do the journey-man or journey-woman’s work work before you can be a master of a craft. It doesn’t matter if you’re talking poetry or quilting or fashion design or musicianship or painting or carpentry or engineering or basket-weaving — or even magic and re-enchanting the world: Start somewhere near the beginning. Get Better. Keep Going. To Walk the Path Of Power, the Work Is On You.